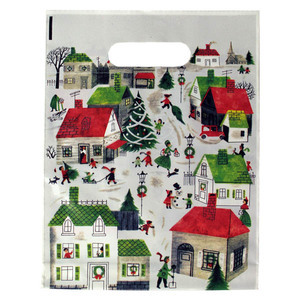 Stunning Christmas & Holiday Plastic bags. We have patch handle poly bags in varying sizes. These holiday plastic bags are in 9, 12, 16, and 20 inches to fit any size of items. Patch Handles prevent handles from easily ripping like most plastic bags. Retro Gift Collection has unique design for each size. The designs on the plastic bag represents a Christmas theme. Different from the patch handle plastic bags which is just sturdy at the handle, these retro gift collection is made of low density which is durable all around. Holiday Plastic bags are sold in 100, 200, 250, 500, and even 1000 per case. Choose from Holiday Spot, Thomas Nast, Halloween, Santa Hat, , Blue Snowflake or Whimsical design for your retail store. We really like the Polka Dot which come in t shirt bags to euro tote plastic bags. American Retail Supply has the best holiday plastic bags which any customer will love and go home with the holiday spirit. Call for any special print or custom logo for these bags, 800-426-5708.